Ask industry professionals who are the biggest parasites in the videogame industry and you might get a surprising answer. It may not be pirates, cynical bloggers, overzealous forum posters or even unethical developers and publishers. This week, at least, it may be a company like Hillcrest Labs. 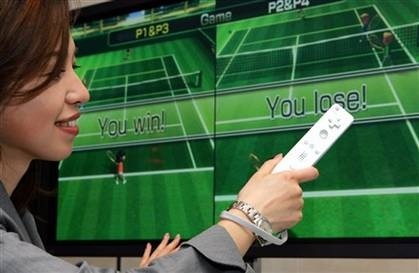 On Wednesday, Hillcrest Labs filed a complaint with the International Trade Commission as well as a federal lawsuit against Nintendo claiming that the gaming giant infringed on four of its motion sensing patents. Hillcrest is the latest in a long legacy of lawsuits filed against major console manufacturers, lawsuits that have cost companies like Microsoft, Sony and Nintendo millions of dollars in penalties and legal fees. As recently as 2006, Microsoft alone was facing 35 to 40 patent infringement lawsuits company wide. Over the past few decades, patents have become a tool in the arsenal of companies looking to aggressively manipulate the market or swing a quick buck. Being awarded a technology patent, which seems to now be as difficult as ordering a Happy Meal, has become the equivalent of buying a corporate lottery ticket, a Powerball for entrepreneurial opportunists. After all, you don't necessarily have to do any work, any complicated R&D, any expensive marketing or distribution. You just have to wait until your patents are vaguely similar to obvious technology that a company like Nintendo might use, and then you bide your time until it chalks up quarterly profits of $996 million and fire your tactical nuclear patent infringement strike. Hillcrest Labs, whose claim to fame seems to be that it has similar technology that uses motion sensing for remote controls, follows nipping at Nintendo's heels only a month after the House That Mario Built was ordered to pay $21 million in damages and $2 million in prejudgment interests to Anascape Ltd., for - wait for it - patent infringement used in the Nintendo Wii's motion sensing controller. Of course, Anascape took the long-view and tossed a nice patent infringement suit at Microsoft for its Xbox 360 controller as well for good measure, just another drop in the bucket of litigation that MS is dealing with. Hillcrest, which appears to not have noticed that Nintendo has been infringing on its patents since 2006, has strictly put the crosshairs on the Big N.
We have gone from a nation that awarded an average of 80,000 patents a year in the 90s to nearly 200,000 patents awarded annually now. And, it appears now the only practical cap on the number of patents released each year is an issue of manpower, as the PTO is wading through a backlog that could take years to complete.